If there isn't a karting track offering Open Days in your local area, a Karting Experience Day may be a better option for trying your hand at karting. These provide the opportunity to experience track karting without having to travel to a specialist karting circuit. These packages are often bought as gifts, and take place at a handful of centres around the UK (for example, in centres in places like Manchester, Thurrock, Wolverhampton, Melton Mowbray, Glasgow and Cardiff). The name is more than a bit misleading as you will rarely get a whole day's worth of karting as part of your karting experience. A typical Karting Experience Day will last for up to two hours but may stretch to four hours at certain locations, although not all of this will involve track time. Before you can get into one of the karts, there will be a safety and instruction briefing and you will be usually issued with safety equipment (unless this is not included as part of the package). Once the instructor is satisfied that you have familiarised yourself with how the karts work, you will be allowed onto the track for some practice laps to get used to the layout of the circuit. The real action will then begin, with most packages offering heats, semi-finals and finals if you can successfully progress through the rounds. The exact schedule will vary from circuit to circuit, but most will at least loosely follow this format. If you walk away as the winner, you'll often receive a prize trophy to celebrate your victory and pose as a lasting reminder of the whole experience. There can be up to 100 people taking part at the same time, which can really test your new-found karting ability to the max! Karting Experience Days tend to be relatively expensive. Each voucher can cost anything from £45 upwards depending on the venue. Most vouchers expire around nine to ten months after being purchased, which is worth bearing in mind if it's a gift. Typically, your experience voucher will only be valid on certain dates throughout the year and these will largely depend on the location in question. 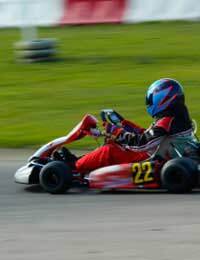 Most Karting Experience Days have a minimum age limit of either sixteen or eighteen, but some will allow younger individuals to take part in them. As karting can be highly physical, it isn't advisable for anyone with poor health – especially if you suffer from heart problems or don't have much strength in your arms and upper body. There are also height and weight restrictions at most locations. On average, you need to be no smaller than 5 foot but no taller than 6 foot 4, although different centres will have differing height requirements so it's best to check before booking if the height or either yourself or the gift recipient is likely to fall outside of these rough guidelines. In addition, a maximum weight of 17 stone will be in place at most locations.